It's no secret that art and design go hand in hand. It's always important to keep growing as a creative and give your clients an awesomely unique experience and not just deliver them a vector logo. Sometimes adding custom illustration is a great way to deliver a unique brand to your client. What could be more special than offering hand-drawn illustrations or hand-drawn icons to go with their branding and/or design? WHAT IF YOUR NOT A DESIGNER? Totally OK! This is for the fun & ambitious creative that wants to learn more about drawing. This system can be used for 40-foot murals or even 8-inch little watercolor paintings. Even famous painter Chuck Close uses this technique when creating his elaborately beautiful paintings. Step 1: Choose an image. For some reason, this took me a very long time and it didn't have to! I get so caught up in what to draw when I know I need to just jump in and start drawing. Set a timer. Take about 5 minutes, gather some photos, and depending on the quality, choose the best one. Make your image an even number in centimeters or inches to the size you would like your composition to be. For example, if your goal is to put this image into an 8x10 frame, then crop it to 8x10. or if you would like it postcard size, crop it to 4x6. After you have your image printed, we need to draw a grid over it. Take a ruler, line it up to each edge of your image and mark every one inch on each side. Once the inch marks are drawn out, connect the marks by drawing lines across using a marker and a ruler. Number and letter your grid so you can keep track of where you are drawing (kind of like Battleship). Let's repeat steps 3-5 and do the same on your watercolor paper, bristol paper, canvas, etc. Artist's tape is a great tool to use for all of your art pieces. It Keeps the edges of your drawing clean and does not rip the paper when you take it off. I definitely recommend getting it, if it is affordable for you (I have a list of all materials at the bottom of this post). Even though you've placed your tape down, I would go the extra step to erase the graphite along those edges. 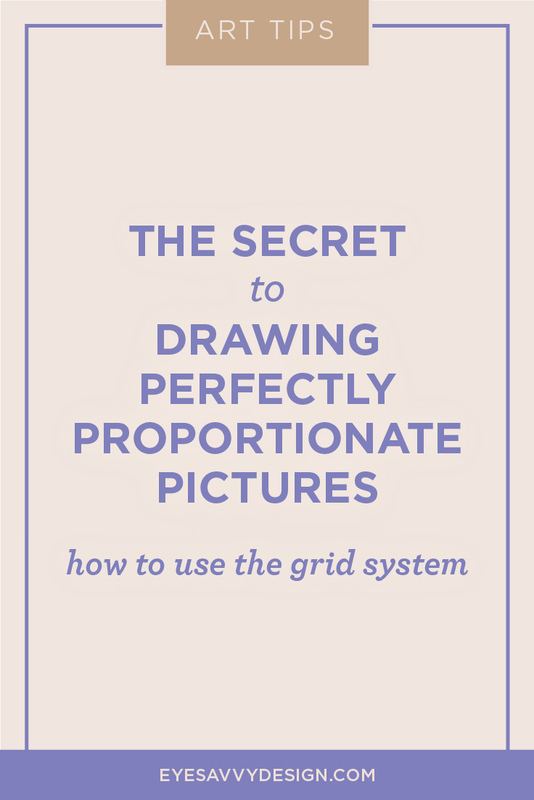 After you have the size of your square or rectangle drawn out, let's draw a grid over it! Take a ruler, line it up to each edge of your image and mark every one inch on each side. Connect the marks by drawing lines across using an HB or 2B pencil. Put very little pressure when dragging your pencil against the ruler and across the paper. 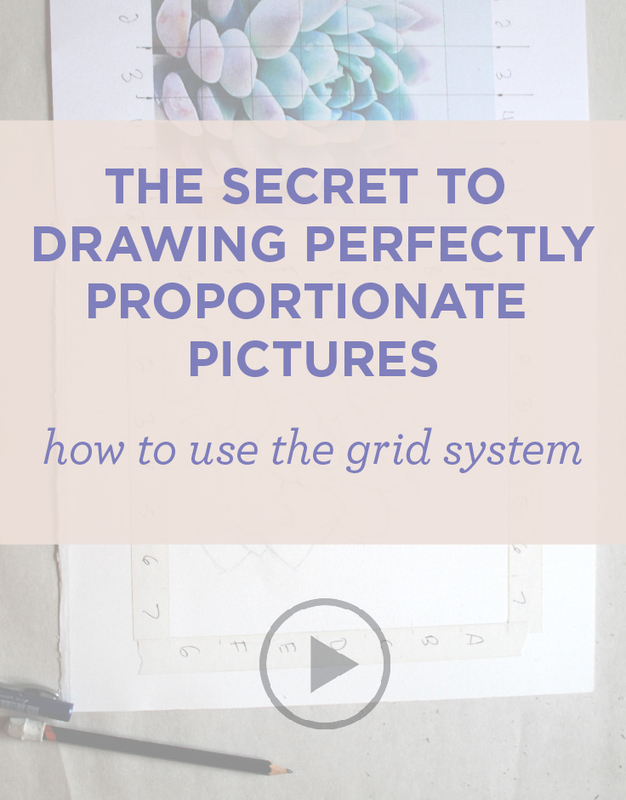 I like to use soft pencils so that it is very easy to erase your grid after you've sketched out your drawing. Single out each square and draw that shape within. Start with outlines, don't jump into shading right away. Use a soft pencil (2B) so that it's easier to erase. 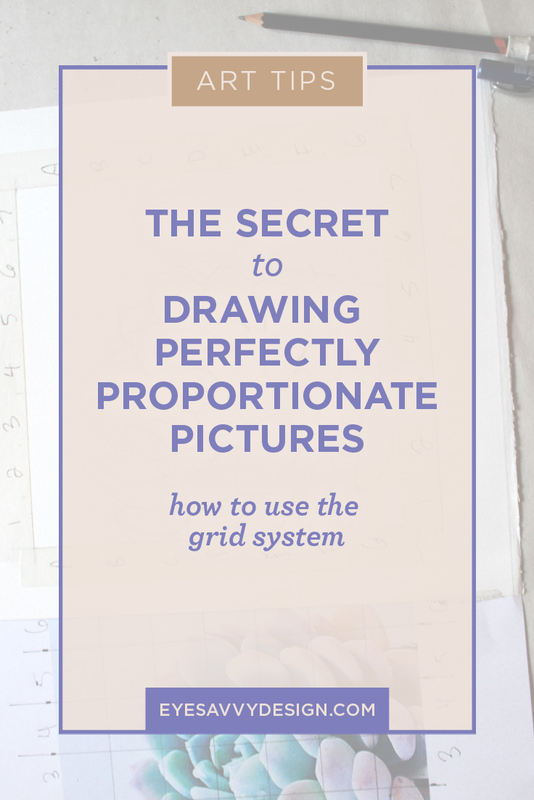 Think of each little square on your grid as its own mini-canvas. An image within an image, a shape within a shape. Take your time to see how certain parts of your drawing go from one box into the next box. Does a line crossover in the middle? Or does a line crossover in a corner and stop in the middle of the next box? 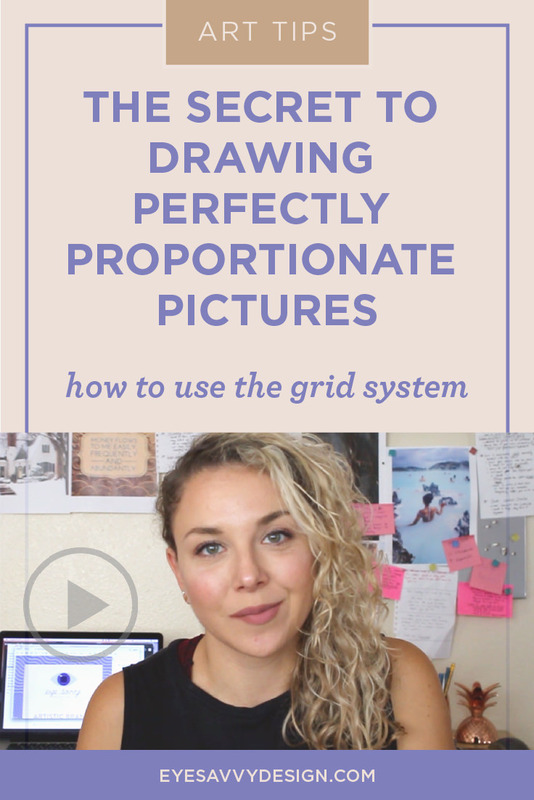 The grid is really a visual mapping system for you to properly measure out your drawing. The more and more you practice this, the more you will start to have a mental grid or "map" in your head and you won't have to go through the process of physically drawing out the grid each time. 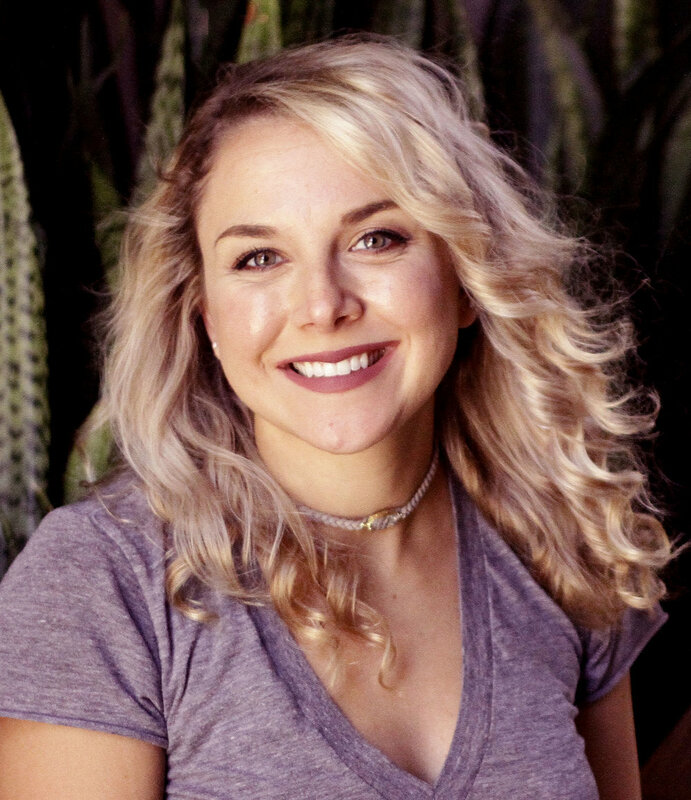 I appreciate you taking the time to read my blog and watch my video! If you have any questions, please don't hesitate to contact me or comment below. What is your biggest Struggle today? Fill out the form below and I can work on dedicating my next blog post or even my online course to helping you in any way I can with Art, Design or Branding. Tell me more about what you want to learn! I'm here to help. Thank you! I'll review your submission and get back to you. Check out my other blog content for more tips and tricks!